Saturday, May 18 | 9:30 a.m. – 5 p.m.
Price: $14 per adult; $13 per senior (62+); $11 per child (2 – 12); children under 2 free. GAA member: $10 per adult or senior. Meet up with Tar Heels for a day of animals and fun at the world’s largest natural habitat zoo. Join us at 10 a.m. for an exclusive live animal experience at the Zoo’s Amphitheatre. There you’ll also receive a zoo scavenger hunt, feeding time schedule and fun swag. All attendees will receive UNC-themed temporary tattoos. GAA members save $4 and sunglasses, too. Be sure to wear your Carolina blue. Already a N.C. Zoo member? You can join us for $5 per person. 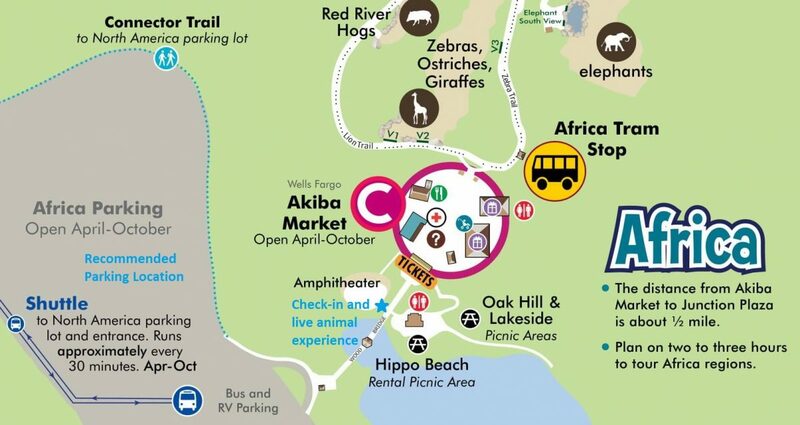 If you plan to attend the live animal experience, please check in with us at the Zoo Amphitheater no later than 9:30 a.m., a map can be found below. You will be emailed your tickets two days prior to the event. All sales are final as tickets are not refundable. Find more information on visiting the N.C. Zoo via their website. Check-in and the live animal experience will convene at the Zoo’s Amphitheatre (see below). This is located to the left of the Africa entrance but you will need to take the path to the right to get there. Parking in the Africa lot will allow for the least amount of travel, please plan to arrive at least 15 minutes before the program starts at 10 a.m.. The complete zoo map and more information on directions and parking can be found via the N.C. Zoo website.